GloPRO Reviews - Is it a Scam or Legit? With 540 stainless steel MicroTips, the GloPRO microneedling skin roller is designed to create channels through your skin to let lotion penetrate deeper. 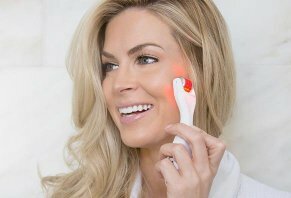 The GloPRO MicroStimulation Facial Tool is a patented microneedle treatment device designed to gently injure and renew your skin, revealing a firmer, brighter, smoother appearance. How? The device uses a LED light and 540 stainless steel ‘MicroTips’ that are designed to create tiny channels in the top layer of skin. This allows your skin to be exfoliated so that your preferred serum can penetrate deeper and lead to a more radiant complexion. Together, the company claims that performing just one minute of the non-invasive, painless treatment three times a week will provide you with ‘age-defying results’ that last. For extra flexibility, each GloPRO subscription comes with two MicroTip head attachments (facial and body) so that the tool can be used on almost every part of your skin. What makes GloPRO different than other beauty products on the market? We’ll start by taking a closer look at how the device works. How Do You Use GloPRO? According to the company website and their YouTube video, the GloPRO microneedling skin roller is simple to use in three main steps. First, the device is designed to be plugged into an electrical outlet before use. For extra flexibility when you aren’t close to an outlet, batteries are also included. To start the procedure in the evening, clean and dry your skin. Next, roll the facial tool across your targeted facial areas like the forehead, cheeks, chin and neck, using moderate pressure to address each area between four and ten times. The included Sterilizing Spritzer bottle can be filled with alcohol and used to spray down the MicroTips after each pass. After the procedure, apply your favorite facial lotion within 60 seconds while the micro-channels in your skin are still open and ready to absorb. With continued use, the company claims you can start seeing results in just four to six sessions. Microneedling and the GloPRO device aren’t limited to use on your face. According to the company website, the body attachment head can be used on any part of your body that you want to repair, including your legs, chest, and backside. When rolling GloPro over your skin, what—exactly—will you be doing to it? Next, we’ll explore the science behind MicroStimulation. MicroStimulation, more commonly known as microneedling, is the process of using tiny surgical needles against the skin in order to trick it into responding like it’s been injured. According to the New York Times, these tiny injuries trigger a biological response by increasing the production of collagen and elastin, which eventually results in fewer wrinkles and less noticeable scars and stretch marks. Wounding skin to improve its appearance isn’t new. Chemical peels, lasers and dermabrasion are also ways to boost collagen production in the skin. However, while these procedures can only be practiced occasionally in order to avoid irreversibly damaging the epidermis, microneedling is frequently considered a safer alternative by many dermatologists, because it utilizes the body’s own healing mechanisms. This is because the process creates micro-wounds that don’t damage the epidermis, while still increasing collagen production. According to a quote from Dr. S. Tyler Hollmig in the New York Times article cited above, this means that microneedling can frequently be repeated without risk of irritating your skin. When performed by a doctor, small studies have shown that microneedling appears to make a difference in wrinkles for women approaching middle age. However, our research on Google Scholar, as well as speaking with GloPro’s media agent, revealed that there doesn’t seem to be a record of any large, peer-reviewed studies on the benefits of microneedling, especially for home systems like this MicroStimulation Facial Tool. Are There Any Studies on the Benefits of GloPro? Browsing Google Scholar for published evidence related to the benefits of microneedling, we encountered about a thousand studies at the time of our research. From a high-level perspective, what did they conclude? One 2009 study on at-home microneedling found that it led to a distinct improvement in the appearance of acne scars for 36 out of 37 participants. The study also found that longer options led to the biggest benefits, with 1.5 mm needles making a difference, but 3 mm needles working the best to remove the most severe acne scars. For comparison, the GloPRO device has 0.3 mm needles. Some research has also shown that microneedling might be more effective than fractional laser treatments. For example, a 2016 study focused on 46 patients found both procedures to be effective, but microneedling was shown to have fewer side effects. On the GloPRO product website, a user study is referenced where participants used the facial device three times a week for thirty days. According to their results, 93 percent saw skin tone improvement, 90 percent considered it an alternative to cosmetic filters, and 97 percent felt that they looked younger. When we reached out to the company directly, we received a research summary of participants’ survey results (not a copy of the actual study) that seemed to validate these claims. What Do Users of GloPRO Have to Say? According to the company website, GloPRO was the 2017 Editors Pick Award Winner from totalbeauty.com. The device has also been featured in the New York Times, Vogue, and Allure. In all three cases, the articles are written primarily about microneedling, and highlight the GloPRO as the most popular home treatment option currently available. In fact, enthusiasm for the GloPRO was so high that, when the device was first launched on the Home Shopping Network March 31, 2016, it sold out in less than 13 minutes. For the rest of 2016, the device was a top seller for the network. On Amazon, customer reception seems to be less enthusiastic. At the time this article was published, the device had 15 reviews that averaged three stars. Some users reported that the device was quick and efficient to use, and that the procedure itself was stress relieving. Others noted that they didn’t notice much difference after four weeks of use, and reported that they believed the device was overpriced compared to cheaper microneedle devices without a LED. A review on Allure.com revealed that the user found GloPRO to be less painful than she expected and that it caused her to get constant compliments on her “glowy” skin after three weeks of regular use. What Are the Risks With Using GloPRO? According to the same New York Times article from earlier, microneedling comes with a small increased risk of infection if it gets rolled through an infected hair follicle. And while the company recommends treating the tool in alcohol between uses, it’s important to keep in mind there’s always a possibility it won’t kill all pathogens. There is also a chance that using the GloPRO can increase your risk of suffering an allergic reaction to the serum you apply afterward, because it will penetrate deeper into your skin. For this reason, CBS News reports that some dermatologists recommend professional microneedling treatments, where serum application can be controlled, but recommend against using an at-home device like the GloPRO. How Much Does GloPRO Cost? On the GloPRO website, there are two ways to buy the device. You can sign up for the “Subscription Benefits,” which requires you to pay three installments of $49.99 each, plus $7.99 shipping and handling with the first payment. The order comes with a 30-day risk-free guarantee (minus shipping and handling expenses) and a bonus GloPRO Body MicroTip Attachment Head that is valued at $45. This attachment is specifically designed to improve skin texture on the back of thighs, arms, kneecaps, and buttocks. With this program, you are automatically enrolled to receive a new Facial MicroTip Attachment Head and Body MicroTip Attachment Head every three months, at the cost of $19.95 per month ($59.85 per shipment), plus $4.99 shipping and handling. According to the website, there is no commitment or minimum to buy, and the subscription can be canceled at any time. For those that don’t want to get new attachment heads on a subscription basis, GloPRO can be purchased without the Body Attachment Head for a single payment of $199. What Beauty Products Are Similar to GloPRO? Several home-based microneedling beauty products have recently entered the market. The Alferdo Derma Roller Skin Care System contains 540 micro needles that are .25mm (the GloPRO’s are .3mm) and is rolled across the skin in order to create micro injuries in the same way. Like the GloPRO, the Alferdo Derma Roller is also designed to be used three times a week directly before applying a nourishing serum. What’s different is that it doesn’t have a motor or a LED light, and instead is simply rolled across the face. At the time of writing, the Alferdo had 341 reviews on Amazon and an average 5-star rating, and retails for $14.99. Another microneedling tool on the market is a Micro Roller from StackedSkincare. Featuring 0.2mm stainless steel needles, this device is similar to the Alferdo Derma Roller because it is designed to be manually rolled across the face to minimize the appearance of fine lines. These needles are slightly shorter than the 0.3mm needles in the GloPRO. At the time of writing, the Micro Roller retailed for $30 on the company website and had an average of 5 stars after 686 reviews. Pro tip: It’s also important to note that the needles on professional devices are longer still, and there is some evidence that these longer needles (usually 0.5 to 1.5 mm) tend to deliver the best results for collagen production. However, these longer needles can also be more dangerous, since they can penetrate deeper into the skin and cause greater trauma. For this reason, it might be a good idea to invest in the longest needles on an at-home device that you can find (usually less than 0.5 mm), but stick to the professionals for anything bigger. Compared to all these other options, we reached out to the company and learned that it relies on something called ‘VibroTactile Stimulation,’ which the company’s press sheet claims acts like a domino effect to push energy deep into the skin without penetrating the epidermis. We were also informed that LED therapy in the tips produces red light that helps increase collagen density and combat the effects of aging, which the company claims causes cells to grow 200% faster than those not stimulated by light. At the time of publishing, we didn’t encounter any clinical evidence reported on GloPro’s site or third-party authoritative sites validating these claims. While we didn’t try this product out for ourselves, our research into recent news articles and professional studies about the effects of microneedling has shown that it’s fast becoming a popular anti-aging treatment, both with professional dermatologists and in home-based products. The GloPRO was the first microneedling device of its kind to be developed, and it created a media storm when it was released on the Home Shopping Network in 2016. However, our search for reviews from verified buyers since then came up short. In our opinion, the scientific research on the benefits for microneedling for collagen production is intriguing, but the research specifically for the GloPRO is limited. When we reached out to the company we received a copy of their summary survey results and the opinions of the study participants, but no hard research. Related: Can Cosmetics Really Penetrate Your Skin? If you are intrigued by microneedling and are looking for a home-based option, GloPRO appears to be a top of the line device. Though cheaper microneedling devices are also available, the GloPRO is the only device our research revealed that has a LED light and a motor, which the company claims allows for a deeper, more even penetration of the epidermis. Our consensus? Microneedling seems to have the research to back up its skincare claims, and the GloPRO is considered to be the premier home-based device if you want to try the procedure for yourself. And if it doesn’t work out, you can always take advantage of the company’s 30-day refund policy. I used the GloPRO for the first time. It hurt a little, but the worst hurt came when I put moisturizer on afterwards. It stung very badly, and it was still stinging the next morning. Don't know why? Has anyone else had the same problem? I used it for a month diligently. No results on my skin and actually got worst. No fine lines or wrinkle reductions. Totally disappointed. I was hoping that this tool would provide results and did what it claims. I have this unit. I would like to love it, but it won't always work. Sometimes it stays on, and other times it won't stay on. I am not sure what the problem is, or if I should even keep it. I am thinking it may help with wrinkles, but is it worth the effort to try to keep it on? Write a Review for GloPRO!